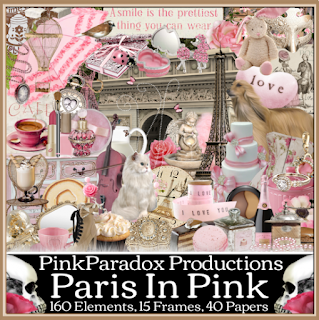 CT Tags For Pink Paradox Productions - Using Kit "Paris In Pink"
This tutorial was written by me on July 28th, 2015. Any resemblance to any other tutorials is purely coincidental! You may not copy/paste any part of my tuts elsewhere, but you may text link to them for challenges etc! **New CT Tag** Scrap Kit of choice, I am using a PTU Scrapkit called *Wild Summer* By Pink Paradox Productions. Copy & Paste to bottom layer. Resize & Position add to center right behind tube. Flip by pressing ctrl+M. Copy& Paste to layer just below tube. Resize & Position add to left side right beside tube and up against car. Flip ctrl+M. Copy & Paste to bottom layer. Resize and Position add to left side of tube up behind element (92) as I have done. Copy & Paste to layer just above element (92). Resize & Position add to left side as if on top of element (92). Copy & Paste to layer just above element (92). Resize & Position add to right side as if under the hood of car. Copy & Paste to top layer. Resize & Position add to right side bottom corner as I have done. Copy & Paste to top layer. Resize & Position add to right side bottom up next to element (28). Copy & Paste to layer just below element (30). Resize & Position add to right side up behind element (30). Rotate. Copy & Paste to top layer. Resize & Position add to right side bottom up in front of element (30). Copy & Paste to layer just below element (29). Resize & Position add to right side bottom up next to element (30). Copy & Paste to layer just below element (5). Resize & Position add to left side bottom up beside element (5) as I have done. Copy & Paste to top layer. Resize & Position add to center bottom in front of tube. Copy & Paste to layer just below element (5). Resize & Position add to left side center of element (95). Copy & Paste to layer just below element (31). 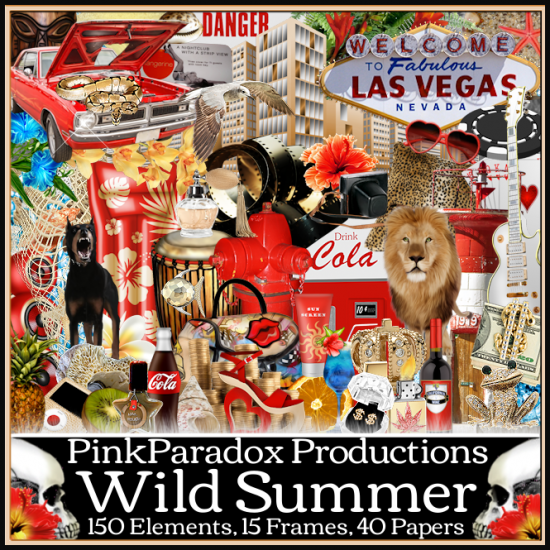 Resize & Position add to center bottom behind element (147) right side. (Duplicate) mirror image your copy by pressing ctrl+B. Copy & Paste to layer just above tube. Resize & Position add to left side down next to flowers as I have done. This tutorial was written by me on July 22nd, 2015. Any resemblance to any other tutorials is purely coincidental! You may not copy/paste any part of my tuts elsewhere, but you may text link to them for challenges etc! Tube or Image of choice, I am using a PTU Tube *Girl and a Pony* By ©Laguna can be found here. Copy & Paste to top layer. Resize & Position to left side toward bottom on canvas. Copy &Paste to bottom layer. Resize & Position add to center right behind tube layer as I have done. Copy & Paste to layer just below tube. Resize & Position add to left side just behind tube. Copy & Paste to layer just above gle31. Resize & Position add to right side up on gle31 as I have done. Copy & Paste to layer just above gle51. Resize & Position add to right side bottom corner of gle51. Copy & Paste to layer just below tube. Resize & Position add to right side bottom right behind tubes boots. Copy & Paste to layer just below tube. 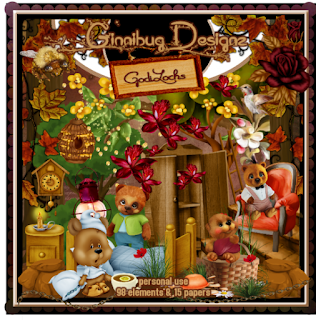 Resize & Position add to right side bottom add as if in middle of other 2 bears. Copy & Paste to layer just above gle32. Resize & Position add to center of gle32 as I have done. Copy & Paste to layer just below tube. Resize & Position add to left side up behind tube. Copy & Paste to bottom layer. Resize & Position add to right side up behind gle31 and gle32. Rotate. (Duplicate) mirror image copy by pressing ctrl+B. Copy & Paste to layer just below gle96. Resize & Position add to center of gle32 just under gle96. This tutorial was written by me on July 21st, 2015. Any resemblance to any other tutorials is purely coincidental! You may not copy/paste any part of my tuts elsewhere, but you may text link to them for challenges etc! 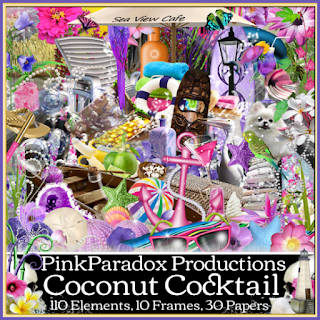 **New CT Tag** Scrap Kit of choice, I am using a PTU Scrapkit called *Coconut Cocktail* By Pink Paradox Productions. Copy & Paste to bottom layer. Resize & Position add to center below tube. Copy& Paste to layer just below tube. Resize & Position add to left side top part of frame (4). Select Eraser Tool with it erase the bottom of element. (Duplicate) then mirror image by pressing ctrl+B. Copy & Paste to top layer. Resize and Position add to left side bottom corner next to tube. Copy & Paste to layer just below tube. Resize & Position add to center bottom below tube and next to element (36). Copy & Paste to top layer. Resize & Position add to center bottom as if on element (37). Copy & Paste to top layer. Resize & Position add to left side bottom up next to element (36). Copy & Paste to layer just above element (37). Resize & Position add to right side bottom up behind element (1). Copy & Paste to layer just above element (36). Resize & Position add to left side in front of element (36) as I have done. Copy & Paste to top layer. Resize & Position add to left side bottom up in front of all elements as I have done. Flip. Copy & Paste to layer just above (114). Resize & Position add to left side middle behind all bottom elements. Copy & Paste to layer just above frames (4). Resize & Position add to right side bottom up behind beach ball. 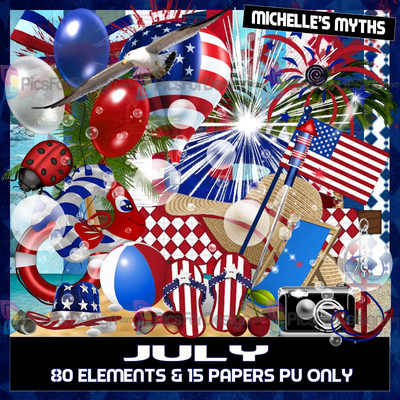 Copy & Paste to layer just below element (60). Resize & Position add to center on canvas as I have done. Flip by pressing ctrl+M. Copy & Paste to layer just above element (67). Resize & Position add to right side up behind sand castle. 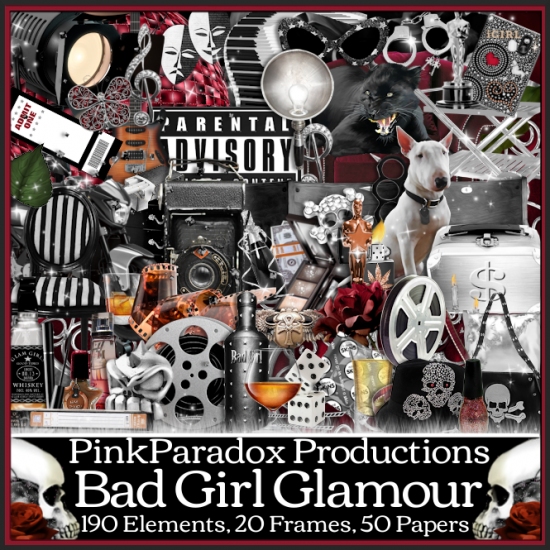 (Duplicate) flip copy. Copy & Paste to layer just below element (71). Resize & Position add to center bottom. (Duplicate) Flip. Copy & Paste to layer just below element (80). Resize & Position add to right side in front of element (71). Copy & Paste to top layer. Resize & Position add to left side up in palm tree. Flip by pressing ctrl+M. Copy & Paste to top layer. Resize & Position add to right side up in palm tree. Copy & Paste to top layer. Resize & Position add to right side up in palm tree. Rotate. Copy & Paste to layer just above element (114). Resize & Position add to right side as I have done. Copy & Paste to bottom layer. Resize & Position add to center to fit inside frames (4). This tutorial was written by me on July 16th, 2015. Any resemblance to any other tutorials is purely coincidental! You may not copy/paste any part of my tuts elsewhere, but you may text link to them for challenges etc! 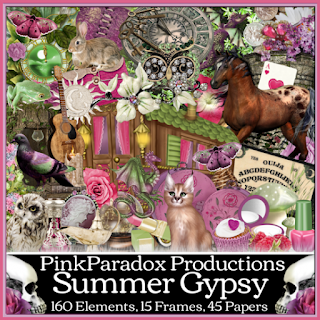 **New CT Tag** Scrap Kit of choice, I am using a PTU Scrapkit called *Summer Gypsy* By Pink Paradox Productions. Copy & Paste to bottom layer. Resize & Position add to right side middle next to tube. Copy& Paste to bottom layer. Resize & Position add to center bottom as if tube is on the grass. Copy & Paste to layer just below tube. Resize and Position add to right side up against tube as I have done. Copy & Paste to layer just below tube. Resize & Position add to left side up next to tube and blend in with grass. Copy & Paste to layer just above element (100). Resize & Position add to left side up behind tube. 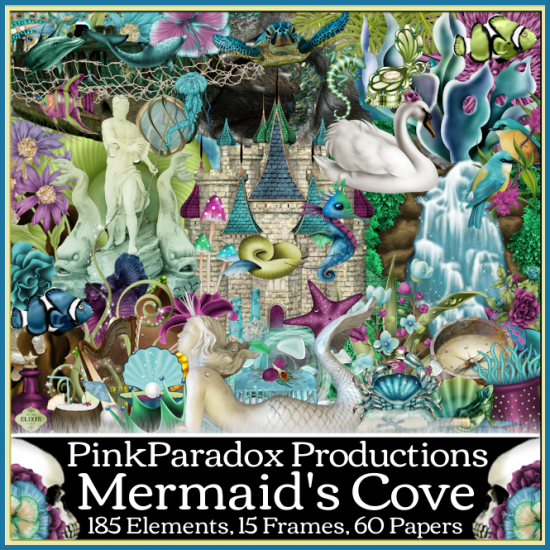 (Duplicate) with copy move to right side up behind element (80). Copy & Paste to layer just below tube. Resize & Position add to left side next to tube on grass. Copy & Paste to layer just below tube. Resize & Position add to right side as if under tubes leg. Copy & Paste to layer just above element (80). Resize & Position add to right side down next to element (41). Copy & Paste to top layer. Resize & Position add to left side up on element (143). Copy & Paste to layer just below element (198). Resize & Position add to left side middle and blend in. Copy & Paste to bottom layer. Resize & Position add to left side up behind all other elements and blend in. Copy & Paste to top layer. Resize & Position add to right side up next to element (80) as I have done. Copy & Paste to layer just below element (38). Resize & Position add to left side up behind element (38). (Duplicate) to make light brighter. Copy & Paste to layer just above element (80). Resize & Position add to right side on steps of element (80). Copy & Paste to top layer. Resize & Position add to left side as if on light post. Copy & Paste to bottom layer. Resize & Position add to right side top of element (80). (Duplicate) add up top on left side. This tutorial was written by me on July 15th, 2015. Any resemblance to any other tutorials is purely coincidental! You may not copy/paste any part of my tuts elsewhere, but you may text link to them for challenges etc! **New CT Tag** Scrap Kit of choice, I am using a PTU Scrapkit called *Bad Girl Glamour* By Pink Paradox Productions. Copy & Paste to bottom layer. Resize & Position add to left side up behind tube as if tube is sitting on element. Flip by pressing ctrl+M. Copy& Paste to layer just below tube. Resize & Position add to center front of element (68) and blend in as I have done. Copy & Paste to layer just below tube. Resize and Position add to left side right behind left foot of tube. Flip by pressing ctrl+M. Copy & Paste to top layer. Resize & Position add to left side up next to foot of tube. Rotate. Copy & Paste to layer just above element (68). Resize & Position add to left side next to element (68) as I have done. Copy & Paste to top layer. Resize & Position add to center bottom of tube. Copy & Paste to layer just above element (68). Resize & Position add to left side up next to element (68). Rotate. Copy & Paste to layer just above element (120). Resize & Position add to right place on top of element(120). Copy & Paste to layer just above element (119). Resize & Position add to center of work. Flip by pressing ctrl+M. Copy & Paste to top layer. Resize & Position add to right side bottom and up next to tube. Copy & Paste to layer just below tube. Resize & Position add to right side in center of element (120). Copy & Paste to layer just below tube. Resize & Position add to right side down behind element (179). Copy & Paste to top layer. Resize & Position add to right side top. (Duplicate) Flip copy and resize. 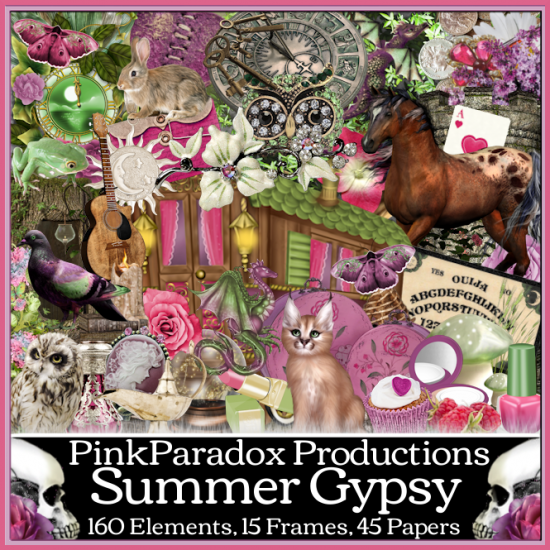 Copy & Paste to layer just below element (15). 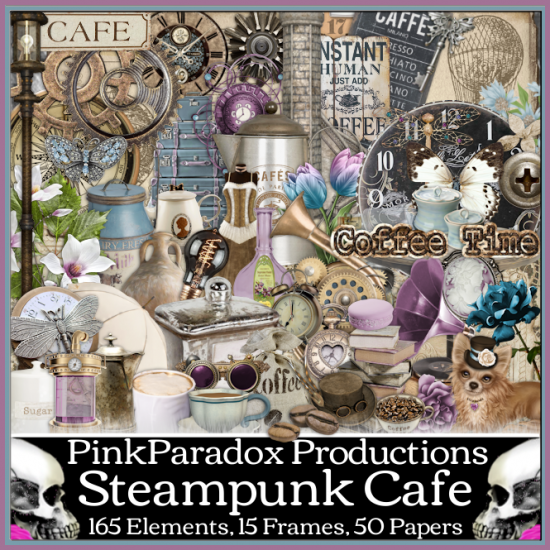 Resize & Position add to right side up behind element (15). Flip by pressing ctrl+M. This tutorial was written by me on July 14th, 2015. Any resemblance to any other tutorials is purely coincidental! You may not copy/paste any part of my tuts elsewhere, but you may text link to them for challenges etc! 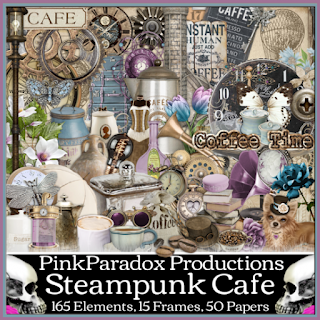 **New CT Tag** Scrap Kit of choice, I am using a PTU Scrapkit called *Steampunk Cafe* By Pink Paradox Productions. Copy & Paste to layer just above frame (12). Resize and Position add to left side middle center on frame (12). Copy & Paste to layer just below tube. Resize & Position add to left side up next to tube as I have done. Copy & Paste to layer just below element (40). Resize & Position add to left side up next to element (40). Copy & Paste to layer just below tube. Resize & Position add to right side up next to tube as I have done. Copy & Paste to top layer. Resize & Position add to right side left side up in front of the other elements. Copy & Paste to layer just below tube. Resize & Position add to right side up against element (33). Copy & Paste to top layer. Resize & Position add to right side up in front of element (25). Flip by pressing ctrl+M. Duplicate) add copy to the other side of your work and place where you wish. Copy & Paste to just above tube layer. Resize & Position add to right side behind element (24). Copy & Paste to layer just above element (110). Resize & Position add to right side up under element (110). Flip by pressing ctrl+M. Copy & Paste to layer just above frame (12). Resize & Position add to right side up top as I have done. Copy & Paste to layer just below tube. Resize & Position add to left side up top. Rotate. Copy & Paste to top layer. Resize & Position add to left side on top of element (39). Copy & Paste to bottom layer. Resize & Position add to center of frame and make it fit inside frame. This tutorial was written by me on July 13th, 2015. Any resemblance to any other tutorials is purely coincidental! You may not copy/paste any part of my tuts elsewhere, but you may text link to them for challenges etc! 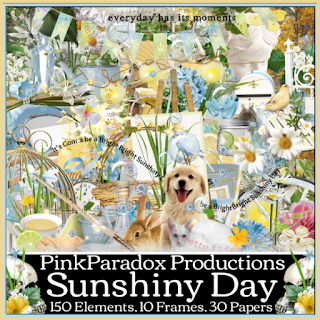 **New CT Tag** Scrap Kit of choice, I am using a PTU Scrapkit called *SunShiny Day* By Pink Paradox Productions. Copy & Paste to canvas. Resize and Position add to bottom center on canvas. Copy& Paste to top layer. Resize & Position add to center toward bottom of tube center. Copy & Paste to layer just above tube. Resize and Position add to left side just behind element (17). Copy & Paste to layer just above tube. Resize & Position add to right side just behind element (17). Copy & Paste to layer just below tube. Resize & Position add to left side just behind tube as I have done. Copy & Paste to layer just above tube. Resize & Position add to center bottom up against tube behind all upper elements. Copy & Paste to layer just above element (40). Resize & Position add to right side bottom. Flip by pressing ctrl+M add as I have done. Copy & Paste to layer just above element (39). Resize & Postion add to center bottom and blend in as I have done. Copy & Paste to layer just below tube. Resize & Position add to right side just behind tube. Copy & Paste to bottom layer. Resize & Position add to behind tube as I have done. Copy & Paste to bottom layer. Resize & Position add to center bottom under tube and top elements. Copy & Paste to layer just above element (77). Resize & Position add to right side up against (77). Copy & Paste to bottom layer. Resize & Position add to right side up toward top as I have done. Copy & Paste to top layer. Resize & Position add to bottom center as I have done. Copy & Paste to layer just below tube. Resize & Position add to center toward top. This tutorial was written by me on July 9th, 2015. Any resemblance to any other tutorials is purely coincidental! You may not copy/paste any part of my tuts elsewhere, but you may text link to them for challenges etc! 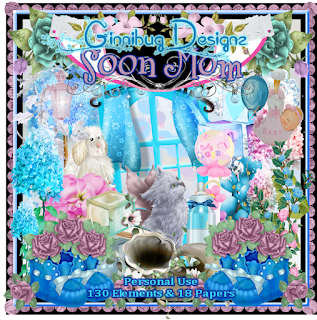 Tube or Image of choice, I am using a PTU Matching Tube *Soon Mom* By ©Lysisange can be found here. Copy &Paste to top layer. Resize & Position add to center bottom on tube. Select Erase Tool. Erase bottom part of tube that is below this element. Copy & Paste to top layer. Resize & Position add to center bottom add in front of Sme9 and blend in. Copy & Paste to bottom layer. Resize & Position add to left side bottom next to tube. Rotate just a little. Copy & Paste to bottom layer. Resize & Position add to center behind tube. Copy & Paste to layer just above Sme38. Resize & Position add to right side bottom up next to tube as I have done. Copy & Paste to top layer. Resize & Position add to right side up against Sme39. Copy & Paste to layer just above Sme38. Resize & Position add to right side middle. Rotate. (Duplicate) then mirror image by pressing ctrl+B. Copy & Paste to top layer. 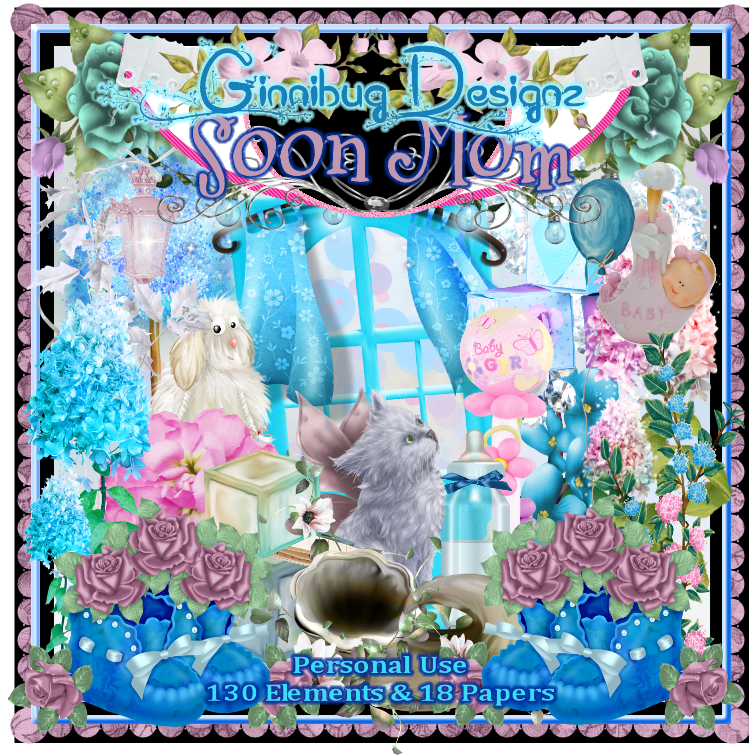 Resize & Position add to left side bottom corner up next to gift as I have done. Copy & Paste to layer just above Sme38. Resize & Position add to center below tube. (Duplicate). Copy & Paste to layer just above Sme38. Resize & Position add to center top part of Sme38. Flip by pressing ctrl+M. Copy & Paste to bottom layer. Resize & Position add to left side up behind Sme38 as I have done. Flip ctrl+M. (Duplicate) then mirror image ctrl+B. Copy & Paste to top layer. Resize & Position add to center bottom. Copy & Paste to top layer. Resize & Position add to right side up on Sme87 as I have done. Copy & Paste to top layer. Resize & Position add to left side bottom corner. Flip ctrl+M. Copy & Paste to layer just above Sme38. Resize & Position add to right side up next to tube. (Duplicate) mirror image ctrl+B. Copy & Paste to layer just above Sme9. Resize & Position add to center bottom between Sme9 and Sme10. This tutorial was written by me on July 7th, 2015. Any resemblance to any other tutorials is purely coincidental! You may not copy/paste any part of my tuts elsewhere, but you may text link to them for challenges etc! 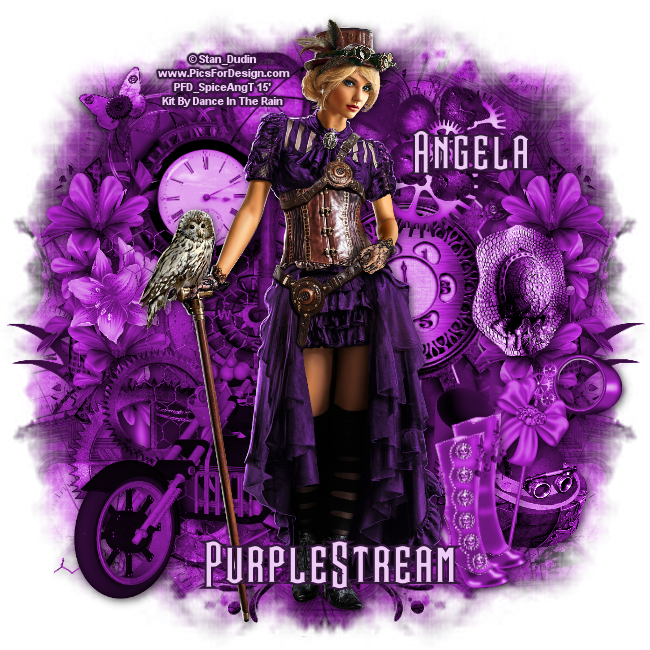 Tube or Image of choice, I am using a PTU Tube *Diana Steampunk* By ©Stan_Dudin can be found here. Copy &Paste to bottom layer. Resize & Position add to center just below tube on canvas. Copy & Paste to layer just below tube. Resize & Position add to left side toward the bottom right next to tube. Copy & Paste to layer just above Element (18). Resize & Position add to left side down behind Element (17) as I have done. Copy & Paste to layer above Element (18). Resize & Position add to right side down behind tube. Flip by pressing ctrl+M. Copy & Paste to layer just above Element (23). Resize & Position add to left side middle of element (18) as I have done. Copy & Paste to layer just above Element (18). Resize & Position add to right side just behind element (23). Flip by pressing ctrl+M. Copy & Paste to layer just above element (18). Resize & Position add to right side middle on element (18) just below clock. Copy & Paste to layer just above element (18). Resize & Position add to right side middle behind element (28). Use erase tool to erase what is over the clock. (Duplicate) mirror image by pressing ctrl+B. Copy & Paste to top layer. Resize & Position add to right side top. Rotate and flip ctrl+M. Copy & Paste to layer just below element (12). Resize & Position add to left side behind element (12) and element (17). Flip by pressing ctrl+M. Copy & Paste to layer just above element (18). Resize & Position add to left side top. Rotate and blend in. Copy & Paste to layer just above element (18). Resize & Position add to right side up beside tube. Copy & Paste to layer just above element (18). Resize & Position add to center bottom as I have done. This tutorial was written by me on July 6th, 2015. Any resemblance to any other tutorials is purely coincidental! You may not copy/paste any part of my tuts elsewhere, but you may text link to them for challenges etc! 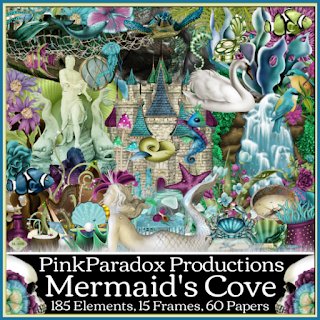 **New CT Tag** Scrap Kit of choice, I am using a PTU Scrapkit called *Mermaid's Cove* By Pink Paradox Productions. Copy & Paste to canvas. Resize and Position add to bottom center off to the right a little. Copy& Paste to layer just below tube. Resize & Position add to left side bottom next to tube. Copy & Paste to layer just above frame 10. Resize and Position add to center of frame 10 as I have done. Copy & Paste to bottom layer. Resize & Position add to right side just behind tube fin as I have done. Copy & Paste to layer just above frame 10. Resize & Position add to left side just behind frog and tube. Copy & Paste to layer just above frame 10. Resize & Position add to left side just next to 61. Flip by pressing ctrl+M. Copy & Paste to layer just above 63. Resize & Position add to left side add between 61 and 63. Copy & Paste to layer just above frame 10. Resize & Position add to right side between tube and frame. Copy & Paste to bottom layer. Resize & Position add to center bottom in frame 10. Copy & Paste to layer just above 119. Resize & Position add to center bottom on sand. Copy & Paste to layer just above frame 10. Resize & Position add to right side upper corner just above tubes fin. Copy & Paste to layer just above frame 10. Resize & Position add to right side toward center up next to tube. Copy & Paste to layer just above frame 10. Resize & Position add to left side add to frame. Flip ctrl+M. (Duplicate) mirror image. Copy & Paste to layer just above frame 10. Resize & Position add to left sie blend in. (Duplicate) mirror image. Copy & Paste to layer just below frame 10. Resize & Position add to right side upper corner. (Duplicate) mirror image. Use Eraser Tool to Erase what is inside frame. Copy & Paste to bottom layer. Resize & Position add to center and resize to fit inside frame. This tutorial was written by me on July 5th, 2015. Any resemblance to any other tutorials is purely coincidental! You may not copy/paste any part of my tuts elsewhere, but you may text link to them for challenges etc! 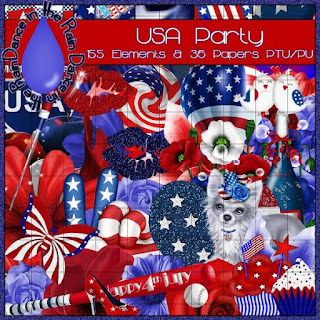 Tube or Image of choice, I am using a FTU Tube *Holiday* By ©Lysisange can be found here. Copy &Paste to bottom layer. Resize & Position add to center right behind tube. Copy & Paste to layer just below tube. Resize & Position add to left side of tubes leg. Flip by pressing ctrl+M. Copy & Paste to layer just below tube. Resize & Position add to right side of tubes leg. Copy & Paste to top layer. Resize & Position add to center bottom up against tubes legs. Copy & Paste to bottom layer. Resize & Position add to center bottom just below tube as I have done. Copy & Paste to layer just above me 7. Resize & Position add to right side up above clown and rotate. Copy & Paste to top layer. Resize & Position add to center bottom just right of shoes. Flip ctrl+M. Copy & Paste to layer just above tube. Resize & Position add to left side bottom and up against tube as I have done. Flip ctrl+M. Copy & Paste to top layer. Resize & Position add to left side upper corner on me 7. Copy & Paste to layer just below me 7. Resize & Position add to left side upper corner. (Duplicate) mirror image by pressing ctrl+B. Copy & Paste to layer just below doll. Resize & Position add to right side bottom next to doll as I have done. Copy & Paste to bottom layer. Resize & Position add to right side bottom blend in. (Duplicate) mirror image by pressing ctrl+B. Copy & Paste to layer just below me 7. Resize & Position add to center of me 7 and resize to fit the frame. This tutorial was written by me on July 3rd, 2015. Any resemblance to any other tutorials is purely coincidental! You may not copy/paste any part of my tuts elsewhere, but you may text link to them for challenges etc! Cope & Paste to bottom layer. Resize and Position add to center right behind tube. Copy & Paste to layer just below camp fire. Resize & Position add to left side behind camp fire. Flip ctrl+M. Copy & Paste to layer just below tube. Resize & Position add to right side toward center, as I have done. Copy & Paste to bottom layer. Resize & Position add to left side blend in with Greenery 04 and camp fire. Copy & Paste to layer just above Greenery 04. Resize & Position add to right side behind jeep. (Duplicate) with copy flip ctrl+M. Copy & Paste to layer just below Greenery 03. Resize & Position add to right side up behind jeep. (Duplicate x2) add coipies as you like. Copy & Paste to bottom layer. Resize & Position add to left side upper corner. (Duplicate) mirror image by pressing ctrl+B. Copy & Paste to top layer. Resize & Position add to left side as if hanging from Tree 01. Copy & Paste to top layer. Resize & Position add to right side up in Tree 01. Flip by pressing ctrl+M. Tube or Image of choice, I am using a PTU Tube *2015 July Desktop Calendar* By ©Arthur Crowe can be found here. Copy & Paste to top layer. Resize & Position add to center on bottom of tube as I have done. Copy & Paste to layer just below tube. Resize & Position add to left side. Flip ctrl+M (Duplicate) add to other side and add as you like. Copy & Paste to top layer. Resize & Position add to bottom on sand place as you like. Copy & Paste to top layer. Resize & Position add to left side upper corner blend in with palm tree. (Duplicate x2) add them as you like. Copy & Paste to top layer. Resize & Position add to bottom on sand off to left side. Copy & Paste to layer just below (40). Resize & Position add to left side just behind (40). Flip ctrl+M. Copy & Paste to top layer. Resize & Position add to right side bottom on sand. Copy & Paste to layer just below (52). Resize & Position add to right side add behind (52). Flip ctrl+M. Copy & Paste to layer just below tube. Resize & Position add to right side bottom just above (80). Flip ctrl+M. Copy & Paste to top layer. Resize & Position add to center bottom on sand. Flip ctrl+M and rotate. Copy & Paste to top layer. Resize & Position add to right center bottom next to beach bag. Copy & Paste to layer just below beach ball. Resize & Position add to left side on sand between beach ball and picnic basket. 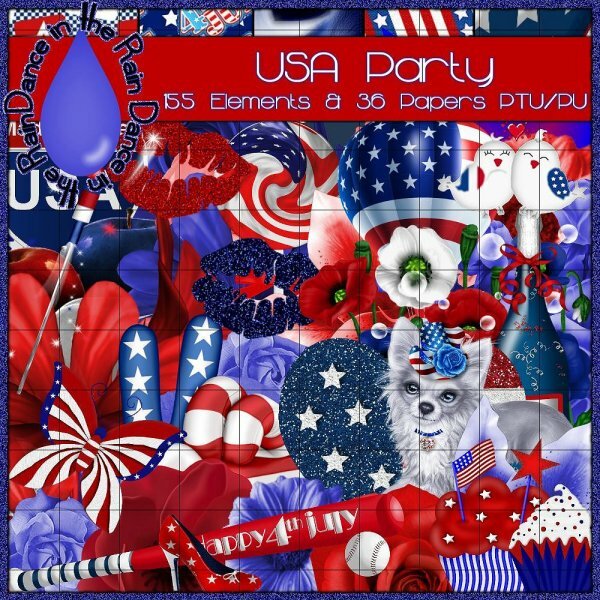 Copy & Paste to bottom layer.. Resize & Position add to back center of element (30) shrink to fit in element (30) as I have done. Copy & Paste to top layer. Resize & Position add to left side bottom corner > Rotate > add up against 98 as I have done. Copy & Paste to layer just above picnic basket. Resize & Position add to left side add string to basket as if tide on. Copy & Paste to layer just above palm tree. Resize & Position add to right side up behind tube. (Duplicate) add to left side as I have done. This tutorial was written by me on July 1st, 2015. Any resemblance to any other tutorials is purely coincidental! You may not copy/paste any part of my tuts elsewhere, but you may text link to them for challenges etc! Tube or Image of choice, I am using a PTU Tube *Wave The Flag* By ©Keith Garvey can be found here. Copy &Paste to bottom layer. Resize & Position add to center behind tube. >Rotate > Select tube > Use Eraser Tool > Erase tube to fit in frame. Copy & Paste to layer just below tube. Resize & Position add to left side bottom. Copy & Paste to layer just above 78. Resize & Position add to left side in front of 78 > Rotate and move to left side. Copy & Paste to bottom layer. Resize & Position add to left side upper corner of 87. Copy & Paste to layer just above 87. Resize & Position add to left side upper corner on 87 blend in as you wish. Copy & Paste to top layer. Resize & Position add to right side toward middle bow on top of 81 as I have done. Copy & Paste to layer just above 81. Resize & Position add to left side bottom corner behind 78 and 79 blend in. Copy & Paste to layer just above tube. Resize & Position add to right side bottom behind 133 and in front of 81 as I have done. Copy & Paste to layer just below 93. Resize & Position add to right side on 81 and rotate. Copy & Paste to top layer. Resize & Position add to right side upper corner on 87 and rotate. Copy & Paste to layer just below tube. Resize & Position add to right side upper corner center behind 129 and resize. Copy & Paste to layer just below tube. Resize & Position add to right side upper corner. (Duplicate x3) add around outside of 149 as I have done. Copy & Paste to bottom layer. Resize & Position add to right side upper corner > Resize > Add as you wish. Copy & Paste to bottom layer. 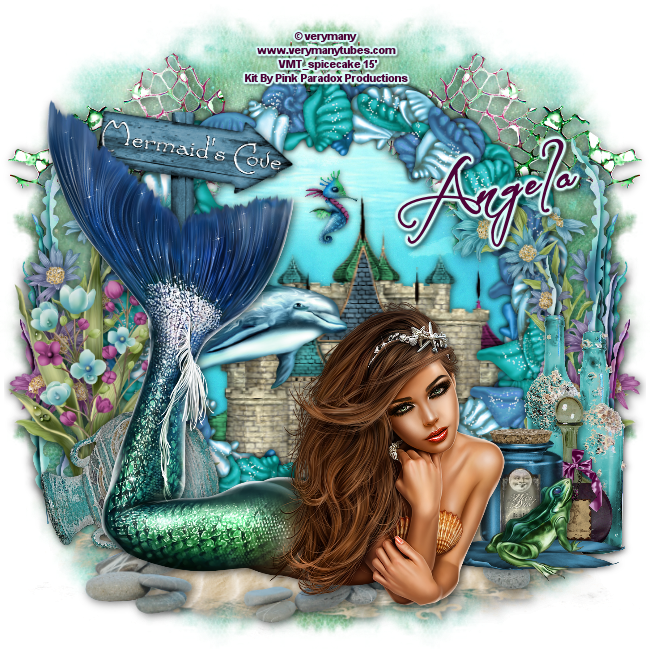 Resize & Position add to right side upper corner > Resize > Duplicate > Add as you wish. Copy & Paste to layer just below frame. Resize and rotate to fit in frame.